Flattering, feminine, and so romantic. A sheer lacy overpiece tops a sleeveless shell with a lacy peplum that peeks out below. Shell has a scoop neck, overpiece a soft V-neck, 3/4-length sleeves and flared shape that hangs longer in back and on the sides. 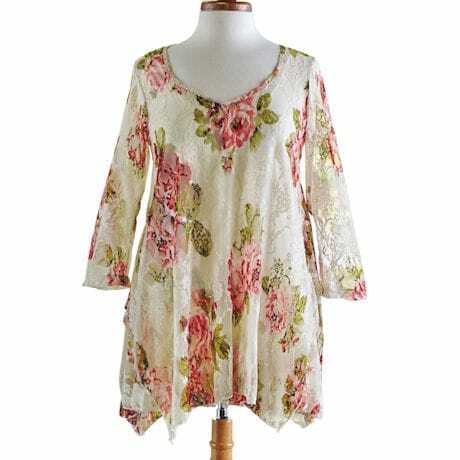 The lace is printed all over with a vintage roses pattern and accented with metallic threads. 92% Nylon, 8% Spandex. Size M hangs 28" in front. Hand wash. USA. Sizes S(4-6), M(8-10), L(12-14), XL(16-18), 1X(18-20), 2X(20-22).